XCOM is big on 50s flavor, but where's the strategy? For many, the title X-COM brings back fond memories of tactical turn-based strategy. 2K Marin's reboot of the franchise is gunning for a more visceral first-person experience. In a room decked out with many 1950s stereotypes of wholesomeness and Donna Reed-style dÃ©cor, producer Drew Smith and designer Harvey Whitney showed us what this new XCOM is all about. 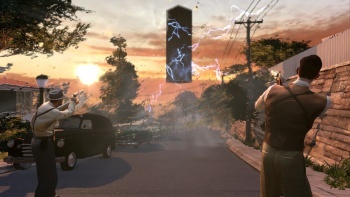 You play as William Carter, a special agent in charge of a secret organization called XCOM. Carter is the guy who discovered an alien artifact that portended the invasion that's now taking place, and instigated the creation of XCOM. The demo began by taking us into the base of operations which was hidden in a non-descript airplane hangar. The flavor of the 50s is in abundance, with agents quipping as Carter walks by, "I don't like the feeling that someone's looking up my wazoo with a microscope, you know what I'm saying?" Only a clean-cut agent from that age would use a word like "wazoo" and actually mean it. At the comm center is a map of the United States where all of the information gleaned from radio and police broadcasts is filtered for possible alien activity. The map shows possible missions that you can undertake, from helping a woman's 911 (did they have 911 in the 50s?) distress call to ways to gain money or Elerium. "Elerium is an alien resource that we need to keep XCOM going," says Smith. "We can also go collect money, we can go do research, etc. You should note that when you pick a mission, you're doing something at the potential sacrifice of another mission. If we take, for example, the California mission, then the Montana or Oklahoma missions may not be available when you come back." I suppose that this is a strategic decision but it feels like the player will be missing out on content instead of feeling that they are making a strong choice. The demo went with the woman's distress call in California, but first we have to pick up some new tech gizmos. A scientist named Mal has been using the alien artifact that Carter found, along with Elerium, to make weapons that use the alien's tech against them. We grabbed a glass vial filled with parts of a black blob (an enemy that you encounter in the game). This "blob-otov cocktail" bursts into flame when it's thrown, which Mal demonstrates for us. In a nice departure, Mal is a Buddy Holly bespectacled 50s greaser, instead of the standard Q (from Bond movies) clone. The mission sent us to a 50s neighborhood, and we tracked a blob trail into a house. Here, the gameplay devolved into your standard shooter. Carter and his agents blasted away at a series of creepy black blobs with shotguns and blobotovs. Another weapon was showcased, the lightning gun, but it didn't seem terribly effective against the aliens. The woman saved, the agents needed to make their way back to the car to get back to base. Unfortunately, a huge alien disturbance showed up in the sky and formed a circle of rock which sent rays at us that vaporized everything in the beam. Clearly, Carter is going to need some bigger guns. The new XCOM from 2K Marin is big on 50s flavor, but the shooter gameplay feels like much of what you've played before. Here's hoping that when the game comes out (slated for 2011), there's more of the strategy that you would expect from the successor to the X-COM that many gamers loved.